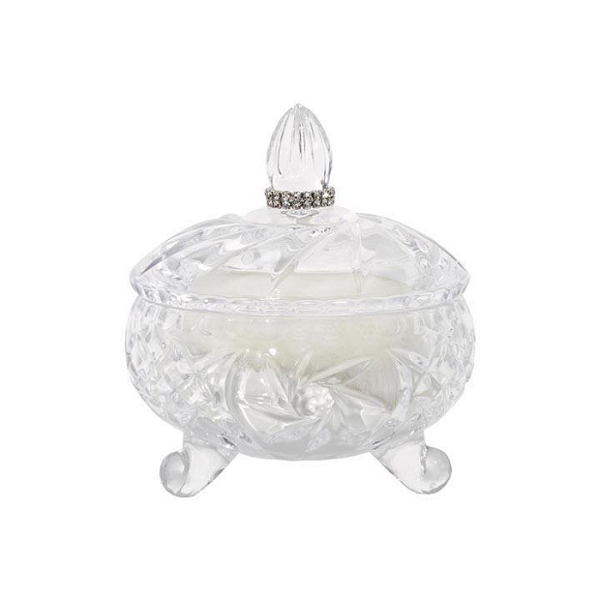 Elegant and beautiful footed glass jar adorned with the signature Tryst jeweled band. A twinkle of shimmer added to finely crushed chamomile & marigold flowers, blended with silk & plant extracts, create a naturally absorbent powder that softens, soothes & protects while delicately perfuming the skin. You'll find a powder puff in the jar to use against your skin. The scent is amazing ... of course! But the powder jar was a pleasant surprise - it's very pretty and lovely enough to leave out on your vanity. I only wish it were slightly larger as I prefer a larger body puff. A twinkle of shimmer added to finely crushed chamomile & marigold flowers, blended with silk & plant extracts.